I am a believer that one of the worst things you can do when making decisions is to do so without data. Worse than making a decision without data though is making a slow decision without data. Worst of all is indecision without data. In an effort to push my reliance on data even further, I am undertaking an experiment to make no decisions without data. I will instead defer those decisions to my Dataless Decision Coin. This coin is not particularly special. 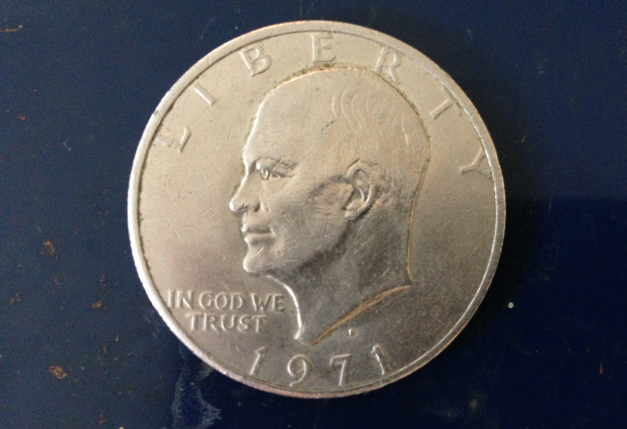 It is a 1971 US $1 coin, commonly called a ‘Silver Dollar’. I’ve had this one for a long time. It was likely given to me by the Tooth Fairy in exchange for a small molar. You can however find a similar coin on ebay for only slightly more than face value. The coin does have one magical property though – when deciding between two options it is right roughly 50% of the time. (I verified this with data!) Most magical of all, it can obtain that accuracy in less than 5 seconds. The way in which I use the coin will be simple. If faced with a decision where there is no data on hand, I will simply defer to the coin. Heads for option A, tails for option B. Why A Dataless Decision Coin? The first part of the solution will come as a side affect of the use of the coin. Once the system is in place, and I trust that I will use the coin, I’m going to get upset about the fact that I’m only going to be right 50% of the time. The only way to avoid using the coin though will be to make the decision armed with data. In this way I will be motivated to get data at times where otherwise I might have taken a shortcut. The second part of the solution comes from the fact that making decisions once presented with data is often quick. In my experience, however, most decision made without data are only made after long deliberations. Often hours are spent debating and ‘analyzing’ options. Forcing the decision to the coin will make the statement, ‘if this decision is not important enough that it is worth spending half an hour looking for data, it is not important enough that it is worth discussing for half an hour – we’ll let the coin decide’. I intend to apply this coin, on an experimental trial at first, to both my personal and work life. During the trial run I will use the coin for not only my own decisions but also any decisions that boil up to me in my various leadership roles – Product Manager & Husband. I suspect the amount of data I’ll be seeing is going to start increasing. What about decisions with more than two options? If I find in practice most decisions offer a differing number of options, I might need to get an 24 sided die which can easily be assigned to handle 2, 3, 4, 6, 8, 12 & 24 option decisions.